Although experts are less willing to openly disclose the fact that adverse reactions can and do include death, one has only to look at reports to the U.S. Vaccine Adverse Event Reporting System (VAERS) to see that mortality is a possible outcome. From 1990 through 2010, for example, VAERS received 1,881 reports of infant deaths following vaccination, representing 4.8% of the adverse events reported for infants over the 20-year period. Moreover, analysts acknowledge that VAERS, as a passive surveillance system, is subject to substantial underreporting. 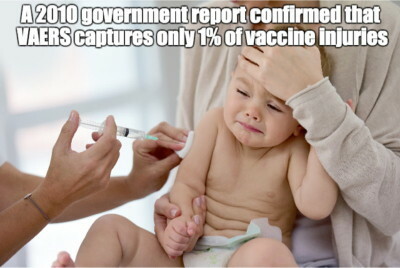 A federal government report from 2010 affirms that VAERS captures only about 1% of vaccine adverse reports.